Aptose Biosciences Inc (NASDAQ: APTO) shares tumbled 27.4 percent to $0.951 after the company disclosed that it will temporarily delay clinical activities with APTO-253 and will prioritize resources for CG'806 with AML patients. DryShips Inc. (NASDAQ: DRYS) shares dropped 25.7 percent to $6.00. DryShips shares have dropped 95.86 percent over the past 52 weeks, while the S&P 500 index has gained 21 percent in the same period. 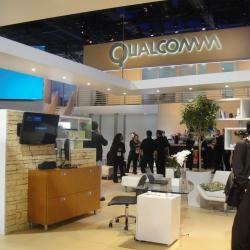 QUALCOMM, Inc. (NASDAQ: QCOM) shares fell 14 percent to $54.11. On Friday, Apple Inc. (NASDAQ: AAPL) disclosed that it is suing Qualcomm over licensing practices. Nomura downgraded Qualcomm from Buy to Neutral and lowered the price target from $80.00 to $70.00. Avianca Holdings SA (ADR) (NYSE: AVH) shares dropped 11.8 percent to $8.34. SenesTech Inc (NASDAQ: SNES) shares declined 9.8 percent to $7.95. SenesTech and Neogen reported that they have mutually agreed to terminate Neogen technology license. ParkerVision, Inc. (NASDAQ: PRKR) dropped 9 percent to $2.34. ParkerVision shares have slipped 1.15 percent over the past 52 weeks, while the S&P 500 index has gained 21 percent in the same period. Nordic American Tanker Ltd (NYSE: NAT) shares declined 8 percent to $8.61. Nordic American Tankers declared a cash dividend of $0.20 per share for the fourth quarter. HealthStream, Inc. (NASDAQ: HSTM) dropped 7.7 percent to $21.00. First Analysis downgraded HealthStream from Equal-Weight to Underweight. Perceptron, Inc. (NASDAQ: PRCP) fell 7.3 percent to $6.21. Perceptron is expected to release Q2 financial results on Monday, February 6. Workiva Inc (NYSE: WK) slipped 6 percent to $12.50. Morgan Stanley downgraded Workiva from Overweight to Equal-Weight. Kornit Digital Ltd (NASDAQ: KRNT) shares dropped 4.8 percent to $16.90 after announcing a 7 million share offering. Travelport Worldwide Ltd (NYSE: TVPT) shares declined 3.1 percent to $13.71. Morgan Stanley downgraded Travelport Worldwide from Overweight to Equal-Weight.